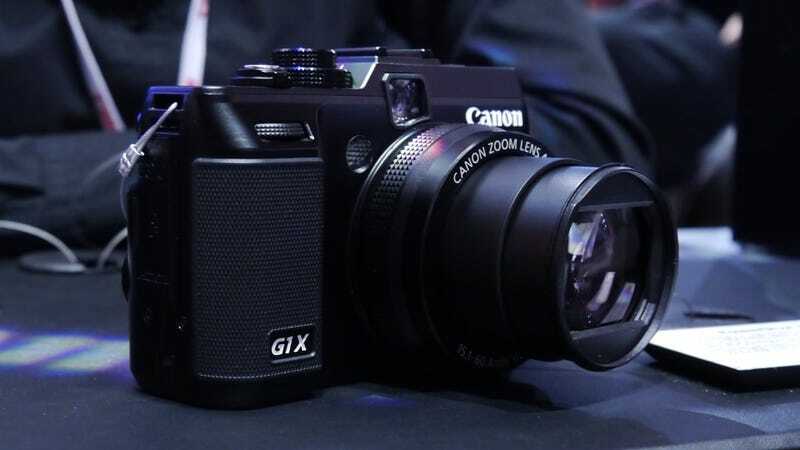 Canon's G1 X is kind of a ridiculous camera. It's a point-and-shoot. But it has a bigger image sensor than most of the mirrorless interchangeable lens cameras out there. And it's $800, so it costs more too. The G1X isn't as heavy as you'd expect, given that compared to any point-and-shoot you've probably seen, the G1 X is absolutely huge. And when you factor in that it's got a fixed lens, you wouldn't save thaaat much space compared to a Micro Four Thirds. I wouldn't exactly call it comfortable to shoot with, either, but the controls are simple enough that it would make a decent downtime shooter. That's what Canon's going for, anyway: the DSLR-using crowd who needs something with more guts than an S95 or S100, but doesn't want the hassle of dealing with interchangeable lenses. We weren't allowed to export any test shots because we saw a pre-production model. The sensor is locked in, but apparently a few tweaks might be made to the processor. But the pictures the G1X took were really nice, from what we could see, and the lens was fast and focused quickly. Frankly, we have no doubt that the final product will take beautiful pictures, but the question is: Which crowd is going to buy this thing, since it's $800? You're locked into one lens, which isn't a particularly fast one, with no possibility of upgrading, with a kit that costs as much as an actual DSLR. So, the pros who want a power point-and-shoot that isn't exactly pocketable? Enthusiasts who want to step up from their first point-and-shoot but don't want to deal with interchangeable lenses? At $500, it'd be a different conversation altogether. We still wouldn't mind spending some more time getting to know the G1 X ourselves, though. To view these photos at full size, visit our HD view beta.